For many years, the TUC has advocated for a modern industrial strategy that brings together government, business and trade unions. It has presented options for inclusive economic growth with increased opportunity and more quality jobs, rather than unsustainable GDP growth with little attention given to the nature of work. Last year, an industrial strategy was embraced by the Business Secretary, Vince Cable, MP with a commitment of over £2 billion in funding to ‘secure jobs and growth’. Now that the question of whether to pursue industrial policy is settled, attention must be paid to how to best implement industrial policy. The impact of industrial policy on the job market should be a central concern of BIS. 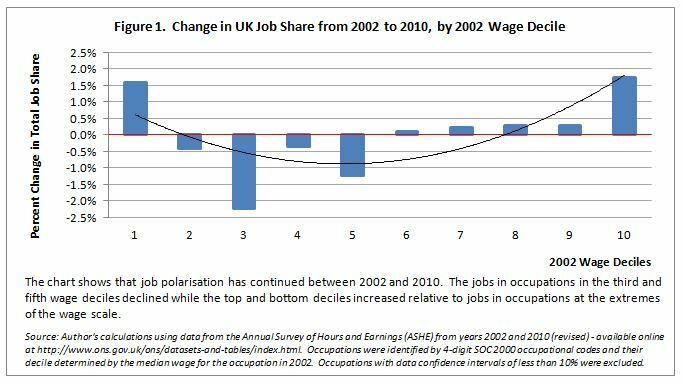 Over the past decade, economists have grown concerned with the apparent ‘polarisation’ of jobs. Research by Maarten Goos and Alan Manning in 2003 and 2007 identified a worrying trend in the UK: jobs are increasingly grouped at the extremes of the income distribution, with relatively fewer in the middle. The trend has continued if not intensified in recent years, as demonstrated in the figure below. Those developing the UK’s Industrial Strategy should take heed of this trend because the root cause of job polarisation appears to lie as a core component of BIS’ current plan for growth: innovation and implementation of new technologies. Technological advancements and wider use of computers have clearly improved the efficiency of routine tasks. Think for instance about secretarial functions or the operation of machinery. What used to take many labour-hours can now be done with only a few thanks to efficient software programs and computer-operated machines. As these tasks have become more efficient, fewer jobs have been necessary to achieve the same level of production. UK manufacturing sector might be taken as a prime example. Since 1979, the number of manufacturing jobs has dropped by over 60% while UK’s value added in manufacturing has actually risen. Economists have historically dismissed the concerns raised by ‘technological unemployment’ because efficient production can lead to lower costs for consumers and therefore lead to overall economic growth. In other words, as tasks become more efficient, one job might be lost, but growth might lead to two more jobs to replace the one lost. This has merit, especially when we keep in mind that while manufacturing jobs have dropped dramatically, the overall number of jobs in the UK has actually risen. The concern raised by Goos & Manning—along with other economists research job polarisation—is that while technological innovation may promote growth, it is also changing the structure of the job market. As some jobs are lost and others created in a process of ‘creative destruction’, the overall impact on the labour market is increased income inequality. For an individual facing loss of their job due to technological advance, they may be forced to look toward lower-paying work. The industrial policy envisaged by BIS discusses preparing tomorrow’s workers with skills needed in the job market, but the demand may be for lower-skilled workers than today and those displaced from middle-income jobs may be bumped down toward lower skilled-work (as a 2011 report The hourglass and the escalator by the Work Foundation, suggested was the case during the recent recession). Policymakers could reconsider the focus of industrial strategy on technology and reduce the role of Government in funding innovation; however, this option would sacrifice potential growth and may prove an overreaction. In her 2013 book, Mariana Mazzucato reminded us that the recent narrative that casts Government as an ‘inertial’ force ‘too large and heavy to be the dynamic engine’ does not fit with the history of Government as ‘entrepreneur’. Quite to the contrary, Mazzucato argued that ‘most of the radical, revolutionary innovations that have fuelled the dynamics of capitalism—from railroads to the Internet, to modern-day nanotechnology and pharmaceuticals—trace the most courageous, early and capital intensive “entrepreneurial” investments back to the State.’ These developments have historically been the driving force behind economic growth. Without job growth, rather than face problems of job quality there could be a potentially worse problem of wider unemployment. Alternatively, policymakers could use social policy to ‘manage change’ caused by innovation to ensure that industrial policy promotes increased opportunity for all. The UK and most nations have long recognized the need to help people land on their feet following job-loss through unemployment benefits. The European Union has operated an ‘Adjustment Fund’ for those impacted by globalization so that it might take some responsibility for the costs of its policies toward increased globalization. A ‘Routinization Adjustment Fund’ might be considered for the UK under the same principle, which could be paid for in the long-run by gains made through economy-wide growth spurred by innovation. To address the long-run polarization of jobs, social policies could focus on raising the quality of service jobs or other work that is less susceptible to automation. Policies that set a wage-floor, such as minimum wage and collective bargaining, could be promoted to improve job quality at the bottom of the wage distribution. I would be most interested in hearing of your thoughts on these issues as they relate to the current US market and social conditions, as well as reaction to the current policies being put forth (or not) by Congress.